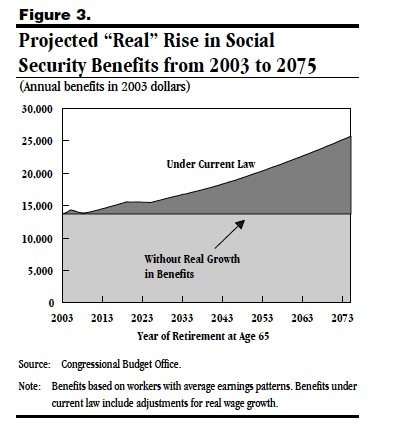 Social Security is under attack. In fact it has been under attack since its beginnings. This site aims to supply the weapons and ammunition defenders need to fight back. And about time, because under the statute if is due "no later than April 1". But I am told on good authority that it will be out this week or maybe next. But eventually. It is underdeveloped right now but does have links to two different Public Folders on the Social Security Defender Google Drive. One of which will be the repository for a whole series of Excel spreadsheets containing the various Tables of the 2014 Report extracted from the PDF and HTML versions released by the Office of the Actuary. Already there is a sample there of a single Excel Workbook with five Worksheets containing five different Tables from the 2013 Report. While the files should be read only, there should be no limit on them being imported or copied into your own Excel spreadsheet or for that matter Google Sheets or Apple Numbers. If anyone actually stumbles accross this message and tries it and for some reason it doesn't work feel free to e-mail me at the contact e-mail on the linked page. Hopefully I will be populating the Google Drive folders and so the Google+ Page with new material soon after the Report release. Well I am going to try to build out the Social Security Defender account to integrate some of the new possibilities for sharing info on the defense. But first the components. Like all G-mail accounts there is an associated Google Drive cloud storage. And a Google+ site. But also I set up a SocialSecurityDefenders Google Group. Along with this Social Security Defenders blog. And in principal all of this can be combined and cross authorized with varying levels of permissions. But all of that is devilishly difficult to coordinate. My inclination is to use the SocialSecurityDefenders Group to grant the fullest access to the account Google Drive and to use a subset of that as Editors of the Social Security Defenders blog. Presumedly all Group members would also be in a Circle on the Google+. And then both the Google Drive and the Google+ site would have some parts and folders shared with the Public. But getting everyone in at the right level might mean some getting unwanted e-mail traffic and others getting the equivalent of an 'un-friending' So apologies in advance as things get sorted out. (Cross posted from dKos) Well let's start where my last diary ended up: Debt Toolkit: Public, Subject to the Limit, Social Security Trust Fund and put those tools to work starting from the same screen shot from Treasury's Debt to the Penny web application. 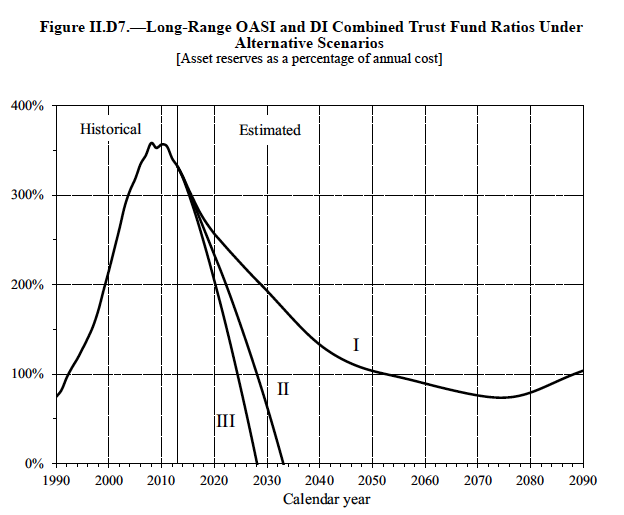 To recap: by law since their foundation in 1939 (OAS) and 1956 (DI) the Social Security Trust Funds have been required to hold all income in excess of current cost in the form of financial instruments fully guaranteed as to principal and interest by the federal government, which in practice means Treasuries. The specific Treasuries held by the Trust Funds are called Special Issues and have some unique features but are legal obligations of the U.S. fully backed up by Full Faith and Credit of the United States. As such the $2.6 trillion in the Trust Funds are held on the books at Treasury as just over half of the $4.8 tn of 'Intragovernmental Holdings' in the screen shot and so right on 1/7th of the $16.4 tn of Total Public Debt Outstanding. And importantly, and as shown in the last diary, an equal amount of Debt Subject to the Limit, that same $16.4 tn. Since Trust Fund assets are over half of Intragovernmental Holdings and those Holdings are included in Debt Subject to the Limit it follows that ANY increase in Trust Fund assets puts pressure on the Debt Limit. Now Trust Fund assets grow in any year where income from all sources, including interest credited to the existing TF assets, exceeds current cost. For example in 2011 Social Security operations on a combined basis were as shown in this linked Table from the 2012 Social Security Report: Table III.A3.—Operations of the Combined OASI and DI Trust Funds, Calendar Year 2011 The literal top line shows cumulative assets of $2.608 (fixed typo) trillion as of Dec 31, 2010, the bottom line $2.678 trillion on Dec 31, 2011. This difference of $69 billion in assets added directly to Intragovernmental Holdings and so directly into Total Public Debt Outstanding and Debt Subject to the Limit. Now it is a fact that this increase in assets is net of interest credited, on a cash flow basis Social Security was actually negative as a portion of the $114 billion in interest earned on existing Trust Fund assets had to be paid in the form of cash. Now one can argue whether this is a problem for taxpayers or not, after all the money comes from somewhere, but for the purposes of deficit and debt scoring that cash flow fact is irrelevant. In 2011 Social Security ran a surplus of $69 billion which subtracted directly from the unified budget deficit. At the same time that $69 billion flowed right to the bottom line of Total Public Debt. Meaning that as regards Social Security the common sense idea that debt is simply the sum of deficits is totally reversed. Social Security surpluses add to debt and don't subtract from it. And of course the reverse is true. If you want to reduce the pressure exerted by Intragovernmental Holdings on Debt Subject to the Limit you would want to REDUCE Trust Fund Assets. And given that growth in those assets is directly the result of income from all sources exceeding cost, the only way to reduce that growth is to either cut income or increase benefits. 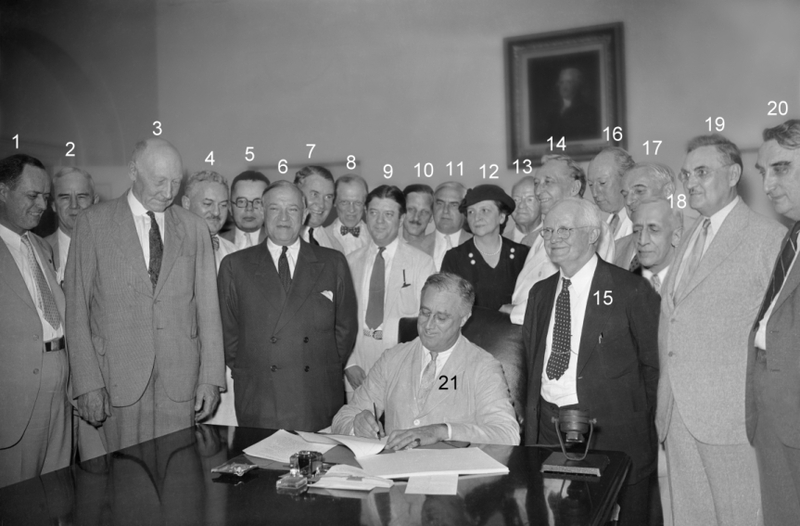 Which leads to the rather astonishing result that over the short run and in specific regards to Debt Limit calculations proposals to means test Social Security and/or impose a new COLA formula via Chained-CPI are arithmetically COUNTERPRODUCTIVE, they tend to put pressure on the Debt Limit and not relieve it. Now this doesn't mean that it is totally irresponsible to address long term solvency issues in Social Security, but dragging them into a specific debate over the Debt Limit is pure blackmail, the 'solutions' the Republicans are demanding have literally less than zero to do with the vehicle which they are using to demand them. Now it is not true (as some supporters would have it) that Social Security has no effect on deficits or in our case debt, because it does. But in ways that go against 'common sense'. 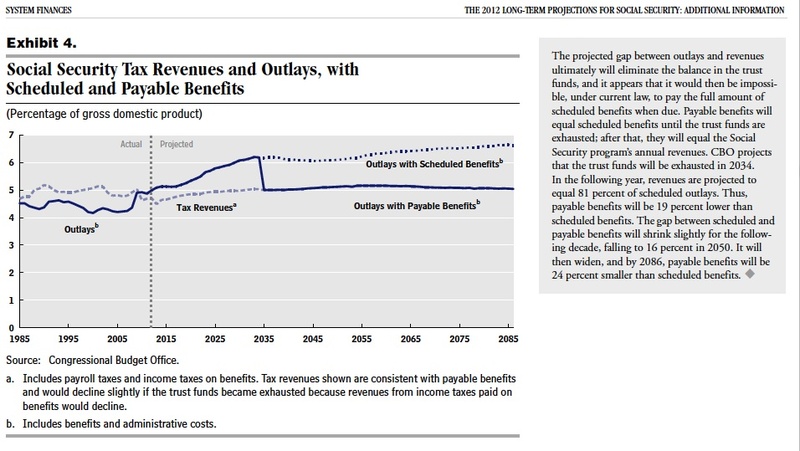 Cutting Social Security cost does less than zero to reduce either short term or long term Public Debt, instead any such cuts either increase that Public Debt or in some formulations (which personally I don't agree with, but are pushed by people smarter than me) leave it unchanged on net. On the other hand Social Security benefit cuts or alternately revenue increases do serve to reduce so called unfunded liability. But unfunded liability is not debt. And for that matter is not legally a liability. Instead it is a purely theoretical calculation of the Present Value of the gap between Scheduled and Payable benefits under Social Security, something I discussed in my diary from Monday Social Security Rashomon: an Actuary, a Defender and a Reformer Meet Now I am perfectly happy to talk for hours and days about Unfunded Liability over either the 75 year actuarial window or even over the (God Help Us) Infinite Future Horizon. Fun stuff!!! But neither that 'Liability' or that Horizon have any direct relevance to either 10 year budget windows or the current Debt Limit. And only fools or liars will tell you different. Or to summarize: House Republicans. (Crossposted from Angry Bear All of the terms in the post title have at least two usages, some of which map upon to common sense ideas from business or household budgeting, some not. Unfortunately the usages that don't tend to be those used in federal budget reporting, and the result is untold confusion. Now one way out would be to listen to me. Then again the relevant line on my CV under 'Budget Reporting' reads 'Some Guy', 'U of Intertoobz'. So really the only way out is to start to build your own Budget, Debt and Deficit Toolkit. And this post is intended to give you a start using sources provided by the official scorekeepers of such things: the U.S. Treasury, the Congressional Budget Office (CBO), the President's Office of Management and Budget (OMB) and the Joint Committee on Taxation (JCT). First stop is the U.S. Treasury Department's Bureau of Public Debt and their web application Debt to the Penny. This handy application allows you to track Total Public Debt and its two components Debt Held by the Public and Intragovernmental Holdings to the literal penny as of the close of the daily books the last business day but one. That is if you check the site on Tuesday it will give you final numbers for Friday. And a search today gave me the results for Monday the 31st (since Tuesday was a Federal Holiday) with Total Public Debt of $16,432,730,050,569.12 . This number is almost exactly the same as Debt Subject to the Limit differing only in the last seven or eight digits, which change so fast that you wouldn't be able to see the difference. Debt Subject to the Limit is set by Congress and under current law is $16.394 trillion. With the result shown in the following official graph Debt Subject to the Limit Graph which shows total Public Debt Subject to the Limit (dark blue) passing through the Limit (orange) on the 31st. Note that in this Summary table the bolded words Deficit (-) or Surplus unmodified by any adjective are unequivocably the sum of 'On-budget' and 'Off-budget' surplus/deficit. This isn't the only usage of 'deficit' in CBO reporting, and in a weird twist of terminology is NOT the same as what they call 'primary deficit', but it is a fair equivalent to what both CBO and the MSM term 'THE deficit'. For example take a standard news story from just today FY2011 Federal Deficit = $1,299,000,000,000 or just a minor update of the figure from the Table. I'll flesh out some of the implications of this in Comments and in later posts but will leave with two points. One almost the entirety of the 'Off budget' surplus of $67 billion is the result of an increase in assets of the Social Security Trust Fund. It is NOT a measure of cash flow nor does cash flow measure into it. Two the claim that 'Social Security doesn't contribute to the deficit' is not quite right. It can and does contribute to the bottom line. But in either positive (surplus) or negative (deficit) directions. And in 2011 a cash flow negative Social Security Trust Fund ran a surplus for the purposes of THE federal deficit as defined. More tools and more discussion later. 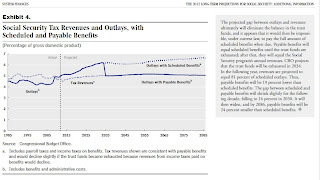 Bottom line: while Chained CPI would be an act of betrayal towards seniors who fully deserve current law scheduled benefits it still would produce a result in the dark gray of Figure 3, meaning a better basket of goods than current retirees get today. And this would likely be still be true after the reset at Trust Fund Depletion shown in Exhibit 4. That is 'Catfood' is simply a useful metaphor for Defenders, it isn't to be taken literally.